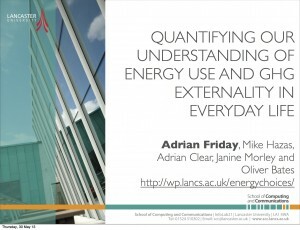 This talk synthesises our recent work on analysing energy use in the home using ‘services’ in everyday life using our quantitative + qualitative method, reprising the argument that eco-feedback and in home energy displays focus the debate on the wrong issues and do not lead to substantial energy savings. We move on to explore how energy supports cooking and uncover a range of broader design opportunities by considering both the direct and embodied impacts of cooking and how they relate to individuals’ food practices. (Thoroughly enjoyed the talk, and some excellent questions from the guys at PITLab).